Norma, thanks to you and watching a little marathon of pizza cuz I wanted to give tomato pies a try. Since the most standout feature of these pies is just different distribution of sauce and cheese, I didn't see it as being too difficult to try. I liked how the flavors are stronger and milder as you eat the pizza. It makes it interesting. My pizza baked a little quicker than I was wanting it to. I was wanting more even golden colors from a 4:30 bake but it needed to come out quickly at 3:30. I agree that your pizza looks delicious all around. With your shorter bake time in the Blackstone oven I should would have liked to have been able to try a slice. I also like how applying the sauce and cheese differently than normal gives different tastes in each bite. This post is to basically explain a few things. Yesterday when I made the batches of dough balls for the boardwalk style pizza my pizza prep fridge didn't want to go down to the right temperature. It was about 56 degrees in the pizza prep fridge, and although I had used less yeast in the formulation, where I was cutting, scaling and balling the dough balls it was 90 degrees F ambient room temperature. The final dough temperatures were about right though. After fiddling around with the pizza prep fridge for about 2 ½ hrs. (while the dough balls were in the pizza prep fridge) I almost gave up on getting the temperature down and decided to put them all into the deli case. I then fiddled around with the pizza prep fridge again while I was making the dough for the Detroit style pizza. The temperature did go down then in the pizza prep fridge, but not as low as it should be. I didn't want to chance putting the boardwalk style dough balls back into the pizza prep fridge and it was getting to late to do much of anything else. I did put most of the pans with the Detroit style dough balls into the pizza prep fridge and hoped for the best in that it would continue to go down in temperature after 5:00 PM when I had to leave market. I also had a repairman at market yesterday fixing a leaking faucet, so I had a lot of dishes to do at once when the faucet was fixed. When I got to market this morning the temperature was down to 37 degrees F in the pizza prep fridge and the Detroit style dough balls in the pan were okay. The dough balls in the deli case were really fermented. I think that happened because they weren't put into a fridge that was cold enough to begin with. Even though the dough balls were highly fermented they could be opened into normal skins today if they didn't warm-up very much. The dough balls first had to be placed in flour and then some of the fermentation bubbles had to be pushed out and the dough balls had to be shaped into somewhat of a normal shape of a dough balls. At least the dough balls when opening into skins did open almost normally. All of these dough balls were really pressed on before opening into skin. The bottom crusts of the pizzas browned well, the bottom crusts were crispy and the rims were tender without any chewiness. I am beginning to really like the All Trumps flour. This is the kind of crust I have been trying to create, but surely not the problems I had with the dough balls. I forgot to mention in my last post that is was hot at market today too. That is one reason the dough balls were opened colder too. Those pizzas look MIGHTY good Norma! Nice and thin but with a beautiful rim. It's great that you were able to save them, despite the prep fridge problems. I've been trying various formulations of dough lately and recently got some KASL flour. I was afraid that the high protein content (about 14%) might make the crust too chewy, so I've been mixing it with bread flour or AP. How do you keep your dough from getting too chewy? I think from all the problems I had with dough balls before that is why I have learned what to do with overblown, or almost overfermented dough balls. I am still learning about that, but it is easier to deal with that now. I did have 3 leftover dough balls yesterday because I wanted to get home to visit my brother a little that is in from Colorado visiting. He leaves to go back today. I will see next week after the dough balls are frozen and thawed what happens to them. When I used KASL on the preferment Lehmann dough thread and with other pizzas I didn't have any problems with the rims, or bottom crusts being too chewy. The mix time in my home Kitchen Aid mixer or my Hobart at market just has to be shorter. Right now with the All Trumps I mix the water, flour, yeast, salt and sugar first until all of the water is absorbed. I just started waiting a few minutes before mixing again and drizzling the olive oil in. The second mix time was only 4 minutes, or until the dough looked like it was at the cottage cheese texture. The gluten does relax after it is out of the mixer, while the dough is being cut and scaled, and while it cold ferments. I sure don't know how Mack's or Joey's mixes their doughs with the higher gluten flours, but from what I understand is the bigger Hobart's mix differently than my 20 qt. Hobart. You can mix KASL with bread flour or AP. How do you mix your dough? You know I have been trying to make a Mack's pizza for awhile, and then when I went to Joey's Pizza I liked Joey's Pizza a lot better than Mack's pizza has been the last few times. The kind of pizza I am trying to replicate and the photos are at Reply 14 http://www.pizzamaking.com/forum/index.php/topic,25251.msg254876.html#msg254876 Joey's pizza wasn't chewy either and from the bag of flour I saw there I assume they use All Trumps. I am trying to get bottom crust browning like Joey's pizza too. I did just down my dough ball weights this past week, but since I reheat slices it works better for me to have the crusts a little bit thicker for the reheat. If I don't have them a little bit thicker in the crust, then the slices want to get floppy in the heated holding cabinet. My rim crusts are bigger than Joey's, but I do that because I would have to add more than 8 ounces of cheese to have my rims smaller. Since the cheese is the most expensive thing that is why I have larger rims. My one friend brought Steve and me a slice of pizza from a local pizzeria I never tried before. Although Steve and I over reheated those slices that pizza sure had a chewy crust and the crusts were also bland tasting. Below are two photos of the slices my friend brought us. Steve and I both gave the thumbs down to those slices. I watched a rerun of tho episode of pizza cuz a few days ago. One of the cousins began to make statement about why the pizza man added the cheese first then the pizza man cut him off and said it was a secret. Does anybody know if there is a specific reason that the cheese goes directly onto the dough? Maybe these links will help more in knowing why the cheese is added first in tomato pies. The reason I think a tomato pie is so unique is because you get a different taste in each bite and the cheese doesn't slide off like some cheeses do when taking a bite. I also found out when experimenting with tomato pies that my oven deck doesn't get as dirty from reheating slices and the mozzarella having a tendency to stick on the deck when the cheese melts in the slice reheats. I think it's really smart that you make your rims a little on the large size in the commercial setting. I'm sure they taste delicious, so no one minds, plus it helps to keep your costs down. As to how I mix my dough, I usually like to vary from under-mixing it to over-mixing it! In all seriousness, the last time I tried to stop mixing when the dough looked like "cottage cheese" I ended up with a dough that was very hard to open. Maybe I should have rested it longer before balling and bagging it. With only 2 dough balls it takes almost no time for me to weigh 'em and ball 'em. With balling it right away I had a dough that wouldn't open for me at all...it wouldn't maintain a round shape so I ended up throwing it in a rectangular pan and baking it in that. A pretty bad result. The next time I went almost to window-pane stage to be sure not to under-mix it, and it was better, but a little too chewy. I guess I need to split the difference....There sure are a lot of possible variables. Are you still dissolving your salt in your water, then putting all the dry ingredients into the flour, mixing them, then adding oil a little later? That's what I normally do. I've also tried putting the salt right in with the yeast, flour, and other dry ingredients and despite the warnings against that method, I really couldn't appreciate any significant difference. As to the browning on the bottom of the Joey's pie, that's got to be from sugar, right? Have you tried upping the sugar content to try and achieve some of that color? I think in our area customers actually like bigger rims. Also since I started making pizzas at market I always have had larger rims, so customers really don't notice that I am using a different dough formulation now, and yes less cheese does help keep the costs down. I have tried all kinds of experiments with doughs. I really don't know what the best way to mix this type of dough is even from all my experimenting. I had to laugh when you posted that your methods can vary from under-mixing to over-mixing. I have been down that same road too. What hydration were you using when you had a hard time opening the dough ball? Maybe a rest period might have helped that dough ball open easier. Do you take your final dough temperatures, or use the “poppy seed trick”? My scaled dough has more time to relax because I mix in larger batches at market. Most members do not recommend mixing to the window-pane stage for this kind of dough. I know there are a lot of variables and even I don't understand them all and have been making pizza dough for quite a while. To give you an example I mix the heck out of the Detroit style dough 2 times with a flat beater with a longer rest period in-between. I would think that would make the crust really tough, but that crust is really light. That is a much higher hydration dough though. I still am not sure about how Joey's gets their pies so evenly brown on the bottom. I really don't know if it is the sugar amount or their Rotoflex oven that does that. It might even be something else. I think I almost have the tomato pie crusts tuned in right. The dough balls stretch out fine and the rims and bottom crusts bake okay. The rim is somewhat crispy, but is tender to eat and the bottom crust is also crispy. I didn't take other photos of the tomato pies yesterday because it was too busy at market due to the fourth of July week. I am not adding much IDY at all to a batch of dough and it seems to ferment just about right until the next day and also the dough balls last well throughout the day. I am using part cold water out of my deli case to mix the dough batches now since the weather is hotter. I don't know what happened to the reballed dough balls from last week, but they were frozen not too long after the reball. I ran out of the boardwalk style dough balls around 6:30 PM and tried to use the reballed dough balls, but they were springy and wouldn't open at all. Steve also tried to open them, but he said they were a lost cause too, so they were thrown away. I did defrost the dough balls for over a day so I thought the gluten should have relaxed by then from the reball, but that was not the case. I didn't take any photos of that mess either. The dough balls looked fine, but just would not open. I also did an experiment on a dough ball that I found on Monday that was left in the back of the bottom top back of my pizza prep fridge from the week before. It sure smelled of alcohol and I thought it probably wouldn't be any good, but I did add flour and some IDY on Monday and tried to knead and ball it to see if it could be salvaged. The first photos are of that dough ball on Monday. It was very clammy. Of course on Tuesday it was no good. I found it interesting how that dough ball wanted to break apart into smaller pieces in the middle even after kneading and adding flour. When market was over and I was cleaning up there was a beautiful rainbow outside. The lights already turned on outside, but the rainbow could be seen for a long while. I stayed outside until the rainbow disappeared. There is something about rainbows that I really like. I had a lot of comments yesterday from customers that said my boardwalk pizzas taste like either Mack's pizza or Grotto's pizza. That made me feel good, because I have wanted to make this kind of pizza for a long while. The only comment that somewhat surprised me was one lady told me my pizzas taste like Mack's pizzas, but the grease from the cheese melting in the bake isn't enough. I had to chuckle at that comment. Thanks for your post, Norma. Gorgeous prose, pizza, and rainbow. A hat trick. I was planning to make some pizzas last night with dough that had been fermenting for a couple of days. When I tried to open the skins, they just fell apart. So I threw them in the oven anyway and made something like pita or naan. And it was pretty tasty! Have a great July 4th. Thanks for your help with the flour too. Thanks for telling me what happened with your dough that was fermenting for a couple of days. At least you made something out of your dough and did like the taste. Good save! I can not figure out why the 3 reballed dough balls wouldn't open right. They just kept springing back no matter what Steve and I tried. I didn't excessively reball them and they looked normal to me. I guess that is a mystery I never will figure out. I hope you have a great July 4th too. I hope Joe Kelley contacting GM reps in CA will help you find the new GM flour there. The man at market that has educational things for anyone to see each week in my area had Indian pipe this week at his market stand. I never saw Indian pipe before and found it interesting that Indian pipe doesn't have chlorophll, the stuff that makes plants green. The photos of the Indian pipe are not the best, but in person it did look like a real pipe. He also had a small box turtle at market this week. He raises small box turtles and then let them out into the wild when they are grown. Last week he had a Eyed Click Beetle. I didn't take a photo of the Eyed Click Bettle, but this a photo of one. They do click. I don't know where this interesting man finds all these things in our area, but he finds them all local. “In Jersey, Trenton’s tentacles have reached other towns. Tony’s in Long Branch was started by the husband of one of Joe Papa’s sisters. Anthony Mack and Vincent Manco grew up in Trenton, where they absorbed tomato pie culture before starting their three Mack and Manco pizzerias in Ocean City (see story, page 44). In 1950, asserts Nick Azzaro, Papa’s became one of the first pizzerias in New Jersey to deliver. The pies would be wrapped in newspaper, and Jimmy Giannini would make the rounds in his 1946 Dodge”. Note: I can not find see story page 44. 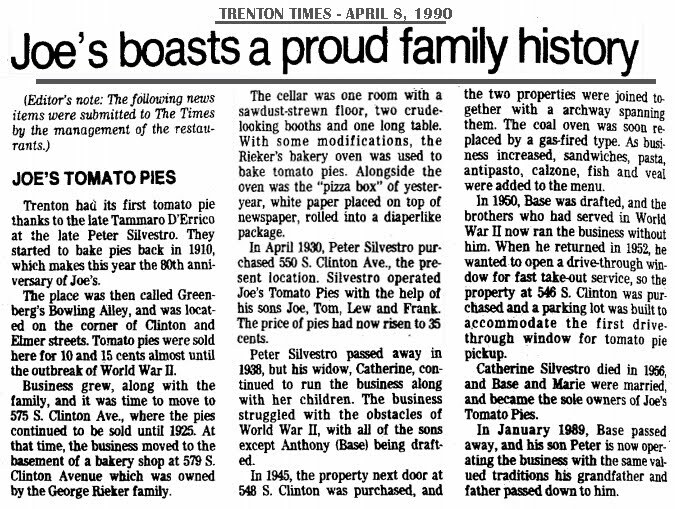 It also seems from the above article that Joe's Tomato Pies in Trenton opened in 1910. This is another excerpt from the article that tells how Papa of Papa's Tomato Pies worked at Joe's Tomato Pies, before lanuching his own Pizzeria. “Papa opened Papa’s Tomato Pies on South Clinton Avenue in 1912, at age 17. He had emigrated from Naples during the prior decade and settled in Trenton in the burgeoning Italian neighborhood of Chambersburg. Before launching his own restaurant, he worked at Joe’s Tomato Pies. Joe’s opened in 1910 and is regarded as the second pizzeria established in America after Lombardi’s, which opened on Spring Street in Manhattan in 1905”. This is a bloggers post about Joe's Tomato Pies in Trenton that is now closed. I think what is said in that article is also interesting. I don't think I have ever seen Joe's tomato pie, but think in the below article that is a photo of what Joe's tomato pie might have looked like. Another article about Maruca's tomato pies which I have never tasted. In this article it tells how Pizza Became an American Classic and also explains about Tomato Pies. I wish I could find a direct link to the man that opens the dough on the video on the above link. It is called “How to Toss a Pizza”. I also wonder what hydration that dough is. In this next article it gives the timelines for pizzas, including tomato pies. I don't know if Capitol Tomato Pie was a tomato pie like I am trying to find out or not. Trenton's Tomato Pie Cult from a blogger. In this bloggers article it says that tomato pies at Joe's Pizza sold for 10-15 cents almost until the outbreak of World War II. I guess Trenton tomato pies are almost the oldest kinds of pizzas in the US. These are photos from Monday when I made some of the batches of dough for the boardwalk style pizzas showing the final dough temperatures and how the dough looked coming out of the Hobart mixer. Some other photos of the top and bottom of a dough ball and other photos. The mixing of the boardwalk dough was using the delayed method of adding the oil and a 5 minute rest period in-between the mix and adding the oil. If there are any questions I will try to answer them about the mix or anything else someone wants to know. The total mixes took about 5 ½ to 6 minutes. The flour used was the All Trumps flour. The dough balls were scaled to 1.20 lbs for about a 17 ½” pizza. The dough balls with the amount of IDY I used seemed to hold out well during the hours I was at market in the fermentation department. The next set of photos will be when some of the boardwalk style of pizza were made yesterday. The problem I am having now since I have almost dialed the formulation I want to always use is I can't figure out in smaller amounts as what to use. I think I might need about another 5 or more dough balls each week. These are the two formulations I used. The first one was for the first dough and the second formulation was for the second dough. Both formulations worked out well for me in the kind of pizza I want to achieve. I wanted to not really press on the dough when opening it to show how there would be a greater rim rise, but I didn't have time to do that. The boardwalk style pizza seemed to brown well enough, were tender in the crumb, had decent bottom browning and baked well in my deck oven. I had quite a few favorable comments from customers from NYC and other places yesterday. There were two customers that asked me when I was coming to York, Pa. to make pizzas. There also was a customer from Philly that said my boardwalk style of pizzas was really good. The problem I am having now since I have almost dialed the formulation I want to always use is I can't figure out in smaller amounts as what to use.